Part I of this article went into detail as how to find exact TDC. With that now behind us, the actual process of checking the camshaft and how it is currently phased within the engine can begin. For this, a 1.000” travel dial indicator will be required that can measure the up and down motion of the lifters. While the number one cylinder is customarily the cylinder of choice in which to check the camshaft, any cylinder can be used to degree in the camshaft once TDC has been found for that cylinder. In fact, later in this operation another cylinder will be checked in which to both verify the results obtained off of the first cylinder check and also insure that the camshaft is at least consistent in values on two different cylinders. For now, the number one cylinder will be used as a reference. There are two basic methodologies in checking the camshaft phasing. One would be to check the opening and closing events of the intake and exhaust lobes and comparing those to the camshaft specification card. Most checks performed with this method for aftermarket cams will be done with the lobe opening and closing events being measured at 0.050” off the heel of the camshaft. For instance, lobe lift is measured at 0.050” after the lifter starts to rise and again at 0.050” before the lifter comes to a rest at the end of its closing event. Some of the older oem Ford grinds use 0.100” for the check so be sure to know what the spec card or manual calls for when checking a camshaft using the opening/closing specs methodology. Because of manufacturing variances and/or excessive lubricant on the lobes and tappets themselves, there tends to be some error introduced into this checking method that can make it difficult to obtain accurate readings. Be aware that most high viscosity cam lube is to be used only on the tappet faces and the lobes and should never be used on the lifter stems or lifter bores; also do not use camshaft specific lube on the engine bearings. While working with lobes and lifters that are simply oiled would give more accurate results, doing it this way would require that the cam lobes and lifter faces be removed to properly lube them for the final engine assembly. Doing this then increases the risk of the camshaft being reinstalled incorrectly if not re-performing the degree in process again. Another method which is also my method of choice involves checking the lobes as measured from their centerlines. This method works for a majority of the camshafts out there and only gives issues when the lobes are special ground to the point they are not symmetrical on the opening and closing ramps at the top of the lobes. The following detailed instructions will be using the lobe centerline methodology. At this point the camshaft, lifters and timing set are already installed. If the crankshaft gear has multiple keyway slots, then use the ‘zero’ position slot as a starting point. Many camshafts already have a given amount of advance built into them and in most instances starting with the ‘zero’ slot will have the camshaft much closer to its desired installed position. Second guessing the camshaft and pre-adjusting the crank gear more often than not ends up having the camshaft being installed way off of the mark when performing that first check. With the dial indicator firmly attached to the deck surface and so that its stem can contact the intake lifter for the number one cylinder, the engine is rotated until that lifter is at full lift as indicated on the dial indicator. Placing the indicator stem at the outer edge of the lifter rather than in the pushrod cup hole tends to also give more consistent readings. With the lobe at max lift, rotate or adjust the dial indicator dial so that it’s reading zero. Now rotate the engine backwards (CCW looking from the front) so the lifter falls back down ~0.060”. Then rotate the engine forward until the lifter rise is at 0.050” before the top of the lobe. The reasoning for going back to a point more than 0.050” from lift peak and then coming back to the 0.050” mark is to insure that any slack in the timing chain is compensated for by loading the chain in the direction that the engine normally turns. At this point, take a reading from the degree wheel as the number of degrees from TDC. In this instance, we’ll use 49° ATDC for the example. Now rotate the engine in a forward direction (CW looking from the front) so that the lifter crests at full lift and continue rotating so that the lifter is now at 0.050” down on the other side of the lobe. At this point take another degree wheel reading as degrees from TDC. In this instance, we’ll use 157° ATDC for the example. Taking the sum of the 49 and 157 values and then dividing by two, the resulting value is 103. This would be the number of degrees that the intake lobe centerline is from TDC. Now looking at the cam spec card, look for the number of degrees that the camshaft is ground on. For this example, the card says the camshaft is ground on 108° lobe centers. With the measured intake lobe value being less than 108° and subsequently closer to TDC, then 108 minus 103 would have this camshaft being 5° advanced. Some cam cards will include the manufacturers recommended intake lobe centerline installation value which can be compared to your measured value. Our card has the recommended installation being at 104° degrees intake lobe centerline which has the camshaft as measured having one more additional degree of advance. Had the intake lobe centerline value been a number greater than the advertised lobe centerline value, then the camshaft would be that number of degrees retarded. If the measured intake lobe centerline equals the advertised ‘as ground’ lobe centerline value, then the camshaft is installed straight up (no advance, no retard). Because of manufacturing variances, we are now going to go an extra step and check the exhaust lobe to get some real numbers on the camshaft and how it has been ground. This is being performed to both verify the checking procedure and also insure that the camshaft is ground as advertised at least for this particular cylinder. So with that in mind, move the dial indicator to the #1 exhaust lifter. Rotate the engine in a forward manner until maximum lobe lift is obtained on the dial indicator and then zero out the indicator dial. Rotate the engine backwards so that lifter falls back down approximately 0.060” and then forward so that the lifter is sitting at 0.050” before max lobe lift. Take a degree wheel reading as degrees from TDC. 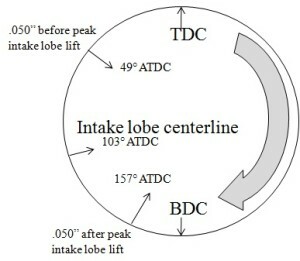 In this instance a 160° BTDC value is indicated on the degree wheel. Now rotate the engine forward (CW looking from the front) so that the lifter crests to max lift and continue forward until the lifter is sitting 0.050” down on the other side of the lobe. The reading on the degree wheel at this point is 64° BTDC. Taking the sum of 160 and 64 and dividing by two gets a value of 112° for the exhaust lobe centerline. Because we are now dealing with the exhaust lobe, any value greater than the advertised lobe centerline will also indicate degrees of advance. In this case, 112 minus 108 equals 4° of cam advance based on the advertised ‘as ground’ lobe centerline value on the spec card. As determined by the individual lobe measurements, the intake is installed at 5° of advance and the exhaust lobe measurement says 4° of advance. Which is correct? To determine this, the two sets of degree wheel measurements must be combined. Add together the measured 112° exhaust lobe centerline and the measured 103° intake lobe centerline values obtained earlier and divide by two. 107½° is the revised or actual ‘as ground’ lobe centerline value rather than the 108° that is listed on the cam card. Revisiting the intake and/or exhaust lobe centerline values and recalculating using the actual ‘as ground’ lobe centerline, the camshaft is actually 4½° advanced instead of the 5° value that was determined earlier by only doing the intake lobe measurement. Because the #1 and #6 cylinders on most V8 engines share the same TDC on the degree wheel, the #6 cylinder will now be used to reaffirm both the checking procedure and any variances in the camshaft itself. (The Buick V8 Nail Head engines are a known exception to the cylinders 1 & 6 sharing the same TDC.) Because the #6 cylinder is being used for the double check, the degree wheel can remain as it was for the #1 cylinder check. Any other cylinder can be used for the recheck as long as exact TDC for that cylinder is found and the degree wheel is adjusted accordingly. In this case, the dial indicator is simply moved to the #6 intake lifter and the same procedure as used for the #1 intake lobe is performed once again. In this instance, the intake lobe centerline measures to be 104°. The dial indicator is then moved to the #6 exhaust lifter and that ends up being installed at 113° lobe centerline. Adding the 104 and 113 values together and dividing by two gives us a 108½° ‘as ground’ lobe centerline for cylinder #6. Taking the 104 value and subtracting from the 108½ value leaves the intake on this cylinder being installed at 4½° of advance. The check for the #1 cylinder also had the actual amount of advance right at 4½° so in this instance, both are identical. In the event there was a difference, then averaging the values would give the advance value to be used for this particular engine. With the numbers obtained from the #6 cam lobes check, the variability within the cam lobes between cylinders 1 & 6 can now be observed. The 108½° value on cylinder #6 is compared to the 107½° degree value that was obtained on the #1 cylinder and there is a 1° difference. That is your lobe centerline manufacturing variance for these two cylinders. This is assuming your cam checking methodology is both consistent and accurate. While 1° of variance would be my own upper limit of variability, there are those cam manufacturers that are comfortable with 2° or more of variability. In summary, the more accurately the cam lobes are ground, the more potential power an engine will make once that camshaft is installed at its optimum position. If so inclined, the camshaft lobes for all eight cylinders can be checked for a better feel for how the camshaft is ground. In this particular instance, the camshaft that was just checked will be left where it is and ran. The scary part of all this is if you only check the lobe or lobes on the #1 cylinder, the variability within the camshaft is basically unknown. That variability can be an engine performance issue all by itself once the engine is in the vehicle and being operated. The caveat to checking a large number of cams from the different manufacturers gives the installer a good feel for which cam grinders do a consistently better job in keeping variances to a minimum; or said differently, which cam companies to stay clear of. As a general rule, most camshaft installations prefer a given amount of advance when being installed. Examining the spec card will give the manufacturers recommended installation specs but if not given those values, then 4° of advance covers most installations. Why advance the camshaft rather than simply install the camshaft straight up? Because a timing chain has a given amount of elasticity, the camshaft retards as the rpm increases so this initial amount of cam advance helps to compensate for this. Also, as a timing chain wears it stretches and as a result, the camshaft is also being retarded over time. All out race engines will break many of these rules in that the camshaft is simply being installed for the best power numbers in a given rpm range. Long term wear or stretch in this instance is not being compensated for. Here is a word of caution regarding moving the camshaft phasing around. As the camshaft is advanced or retarded, the intake and exhaust valve relationship to the piston at TDC is changed. Depending upon the engine and the piston design, the potential is there for a valve to contact the piston resulting in a catastrophic failure if valve to piston clearances are not being checked. As the camshaft is being advanced, the intake valve becomes closer to the piston; as the camshaft is being retarded, the exhaust valve becomes closer to the piston. A general rule of thumb for flat tappet camshafts is for each 4° the camshaft is moved, the valve to piston clearance is altered roughly 0.025”. If the camshaft is advanced 4°, the intake valve becomes ~0.025” closer to the piston; if the camshaft is retarded 4°, the exhaust valve becomes ~0.025” closer to the piston. While the first part of degreeing in the camshaft is simply checking to see where it is initially installed, the second phase of the operation is actually moving the camshaft so its relationship to TDC is altered. If the camshaft has been found to be off enough to necessitate a change, then the camshaft phasing in relation to TDC will need to be moved. On some engines, one degree of change may be critical while on others it may take four degrees to be significant. Changing the camshaft phasing on some engines can be performed at the camshaft gear by lieu of using an offset key or offset bushings. Where the crankshaft gear has multiple key slots, then the appropriate slot can be used to move the camshaft a given number of degrees in one direction or the other. Where the crankshaft gear has only a single slot, then an offset key can be used at the crankshaft with the direction of the offset that’s built into the key determining either advance or retard. Another option where the crank gear only has one key slot is broaching an additional slot at a new position in the gear to also move the camshaft in the desired direction and amount. Likewise, a new key way slot can be broached into the cam gear or a new dowel pin hole placed at the appropriate spot on the gear. To advance a camshaft, then either the cam gear is turned more clockwise (looking at the front of the engine) or the crank gear is turned more counter clockwise in relation to the opposite gear not moving at all. To retard a camshaft it’s the opposite scenario where the cam gear is turned counter clock wise or the crank gear is moved clockwise. Advancing the camshaft simply has the cam timing events occurring sooner while retarding the camshaft has those same events occurring later. While part II of this article ended up being more complicated than I envisioned, I trust it is laid out in such a manner that the cam degreeing in process has been simplified. Part III will go into the specifics of the Rollmaster timing set for the Ford Y-Block and the nuances in moving that particular crank sprocket to achieve the desired results. Until next issue, happy Y motoring. Ted Eaton. This article was originally published in The Y-Block Magazine, May-Jun 2015, Issue #128.